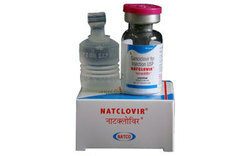 We are a leading Manufacturer of natclovir inj 250mg, natflu 75mg, natzold and natclovir from Mumbai, India. Anemia (low number of red blood cells), Breathlessness, Diarrhoea, Decreased white blood cell count (neutrophils). How to use Natclovir Injection Your doctor or nurse will give you this medicine. Kindly do not self administer. Show moreHighlightsCommonly asked questions for Natflu 75 mg CapsuleOnset of actionThe time required for this medicine to show its effect is not clinically established.Duration of effectThe time until which this medicine remains active in the body is not clinically established.Safe with alcoholInteraction with alcohol is unknown. It is advisable to consult your doctor before consumption.Is it habit formingNo habit forming tendency has been reported.Usage in pregnancyThis medicine is not recommended for use in pregnant women unless necessary. All the risks and benefits should be discussed with the doctor before taking this medicine.Usage while breast-feedingThis medicine is recommended for use in breastfeeding women only if absolutely necessary. All the risks and benefits should be discussed with the doctor before taking this medicine. NATZOLDis in a group of medicines called bisphosphonates (bis FOS fo nayts). This medicine inhibits the release of calcium from bones. Zoledronic Acid is a supportive care drug in the category of bisphosphonates. 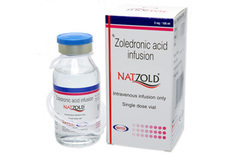 NatcoZoledronic acid is used as a support medication to treat symptoms of cancer such as hypercalcemia (high blood calcium levels) or to decrease complications (such as fractures or pain) produced by bone metastasis (spread of cancer to the bone). It is also used in treatment of Osteoporosis and other bone diseases. nausea, vomiting, stomach pain, loss of appetite; diarrhea, constipation; bone pain, back pain, muscle or joint pain; swelling in your feet or ankles; weight loss; headache, tiredness, weakness, dizziness; numbness or tingling; cough, trouble breathing; or sleep problems (insomnia). severe skin reaction--fever, sore throat, swelling in your face or tongue. 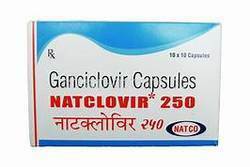 Natclovir (250 mg)is an antiviral agent, prescribed for cytomegalovirus (CMV) retinitis (eye infection that can cause blindness) in people who have received organ or bone marrow transplants. It prevents the spread of CMV virus. IV The recommended initial dosage is 5 mg/kg (given intravenously at a constant rate over 1 hour) every 12 hours for 14 to 21 days. Maintenance 5 mg/kg over 1 hour once daily, 7 days per week, or 6 mg/kg once daily, 5 days per week. -Avoid rapid or bolus (large amount) administration. - Caution should be exercised in patients with history of mental illness, epilepsy, kidney or liver disease, eye problems, decrease in blood counts, elderly, children, during pregnancy and breastfeeding. - It may cause dizziness, drowsiness, or blurred vision, do not drive a car or operate machinery while taking this medication. - Avoid any vaccination, alcohol consumption while taking this medication. It may lead to poor blood clot, avoid injury or bruising. Store it at controlled room temperature (25 DegreeC to 30 DegreeC) and in an airtight container. Keep away from children.